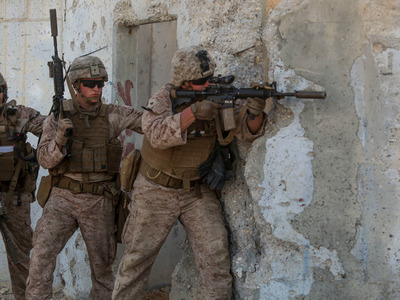 US Marines and Israeli special forces units practiced urban warfare, helicopter insertions, and medevac operations in a mock Middle East village, complete with Arabic graffiti and its own mosque. 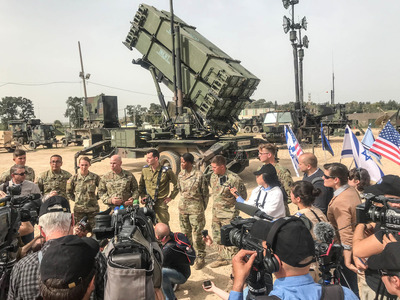 The drills, dubbed “Juniper Cobra,” are intended to strengthen the already strong ties between Israel and the US, and for troops from both countries to share lessons learned in war zones like Afghanistan, Iraq, and Gaza. 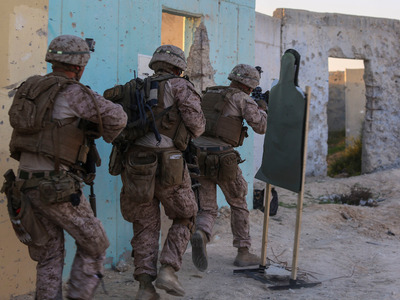 “They teach them what to see when they were either in the Gaza Strip or somewhere else on the battlefield, for us in Afghanistan and Iraq, and teach that young soldier what to look for,” Lieutenant-Colonel Marcus Mainz of the 26th Marine Expeditionary Unit told Reuters. “We are willing to work and train together, and if God wills it, if we ever need to be side by side, then we will,” Mainz said. The main focus of Juniper Cobra is urban warfare training. US Marine CorpsU.S. Marines assigned to the 26th Marine Expeditionary Unit (MEU) conduct a live-fire exercise, as part of exercise Juniper Cobra, March 11, 2018. Some of the urban warfare simulations were live fire drills, meaning live ammunition was used to make it as realistic as possible. US Marines and Israeli soldiers taught each other lessons they had learned from the respective war zones they had been deployed to. The mock village used in the exercise included Arabic graffiti and a mosque, and was made to look like an average Middle Eastern town. Everything from house clearing operations to offensive operations in an urban environment was practiced. One of the first lessons of urban combat: be sure to watch the surrounding rooftops. Medical evacuations, also known as medevacs, were practiced. Some armoured vehicles were used, like this LAV-25 from the US Marines. The exercise also included anti-air and anti-missile drills. US ArmyCol. David E. Shank, commander of 10th Air and Missile Defence Command and Soldiers of Delta Battery, 5th Battalion Air Defence Artillery, Cpt. Dustin Colegate, commander of Delta Battery, 2nd Lt. Jessica Slade, launcher platoon leader, Sgt. Jordan Jones, engagement control station operator, Spc. Kyle Kerr, launcher operator and Spc. Julian Avina, launcher operator, participated in the Juniper Cobra Media Day at Hatzor, Israel March 8, 2018. US Marines and Israeli soldiers practiced missions with large transport helicopters, like the Sikorsky CH-53E Super Stallion. CH-53E Super Stallions picked up and dropped off Marines and Israeli soldiers, and demonstrated its heavy lift capability as well. Helicopter insertions were also an important part of the exercises. As were small UAV operations. 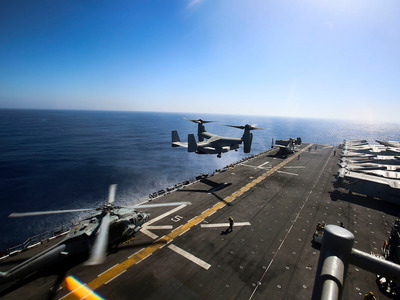 The helicopters, which included V-22 Ospreys, came from the 26th Marine Expeditionary Unit, and carried the Marines from the USS Iwo Jima to Israel from the Mediterranean. US Marine CorpsA U.S. Marine MV-22B Osprey assigned to Marine Medium Tiltrotor Squadron (VMM) 162 (Reinforced), 26th Marine Expeditionary Unit (MEU), lands aboard the Wasp-class amphibious assault ship USS Iwo Jima (LHD 7) in Mediterranean sea after flying Marines to shore in Israel for exercise Juniper Cobra, March 7, 2018.